What to do when your TO DO list is longer than the hours in a day? When “unpack office/studio” makes the list of chores necessary for settling into a new house, but doesn’t yet rise in priority? When painting walls takes precedent over painting watercolors? My solution: make a simple sketch and go wash the bedroom floor. Still, I can’t complain. I’m settling into a beautiful place and managed to take time to explore the stream and woodland that runs alongside and beyond the house. And I trust that there will be days—and years—ahead for putting more of this lovely place on paper. 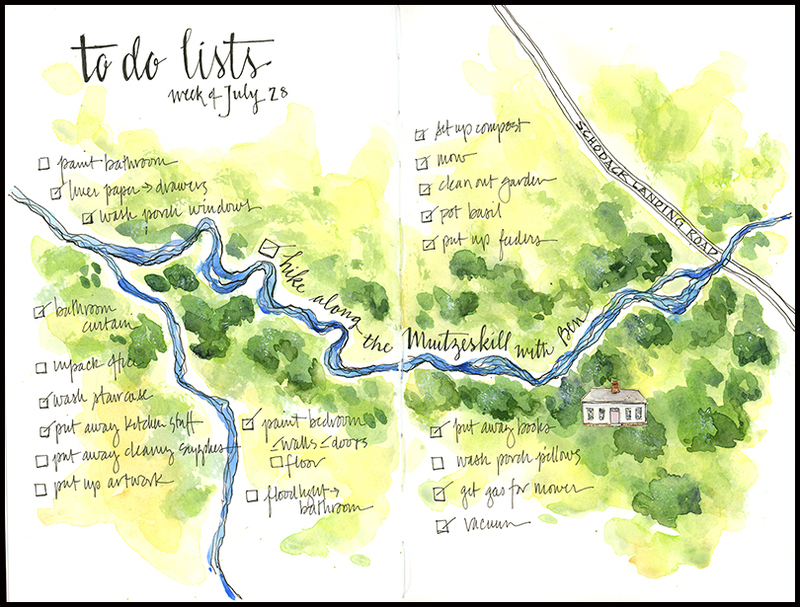 This entry was posted in Journal and tagged home, maps, place-making, watercolor sketch by Jean Mackay / Drawn In. Bookmark the permalink. This was great! What a wonderful idea… now your To Do List seems FUN! Well…almost fun. I have to say that scrubbing walls and floors, while satisfying in the end, is NOT fun. Thanks for your comment! Will do! But feeling settled requires a few things to be in order…like setting up a bedroom. Making progress! You’ll get there, but let us know-how you get on. I suspect you’ll see if as time goes on. I’ve got to pick up a paint brush tomorrow and paint my bedroom floor…then maybe back to watercolor while it dries! Beautiful. And most of it is checked off. Thanks Lisa– Yes! Lots of progress…and, of course, things checked off get replaced by new things. Still, It’s great to see things come together. I’m glad you like your new home and the stream would be lovely. seems to me there’s many hours of watercolors ahead. Absolutely. This is a wonderful place for exploring and painting in all seasons. I feel very lucky to have landed here. It’s beautiful! Oy. I’m overwhelmed just reading what you’ve already done & what’s still to do. I agree about having to have some sort of order around you before you can enjoy creative painting. But I know we’ll all be happy when you’re back in your groove….. Thanks Melissa! I realize that I really need to paint my office/studio before I can really set up and use it. That job has now been added to my list! But given another week or two I should be back in the groove.